Prefer a book of codewords? 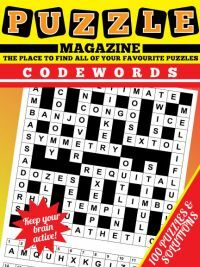 Then visit our 100 Codeword Book page. Prefer to play online? 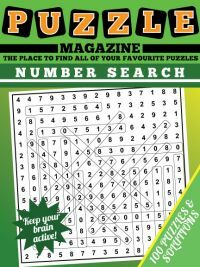 Then check out our Online Codeword Puzzles. Codewords are an interesting crossword variant that have appeared in several newspapers and magazines for many years. The rules are simple, but codewords can be deceptively tricky to solve. There are two issues of this magazine available for purchase: if you already have issue one, scroll down to the bottom of the page for issue two. The start of the puzzle looks a little like a crossword grid that is empty, but with a noticeable difference. A sample of a start position is shown to the right. You will notice that each cell has a number in it, and in fact each cell has a number from 1 - 26 in it. These numbers in the codeword start position represent A - Z in some order, so 1 could represent M, and so on. Once you work out which letter is coded for by a number then wherever you see that number, you can enter that letter in the grid. 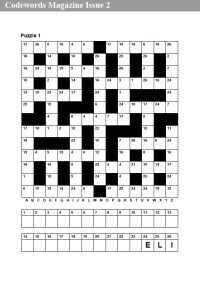 The aim is to crack the code and therefore fill in a valid crossword grid. In order to help get you started in codewords, some letter / number combinations are revealed to you. Each puzzle will reveal certain letters underneath the grid, and so the first task is to go through and enter in those letters. 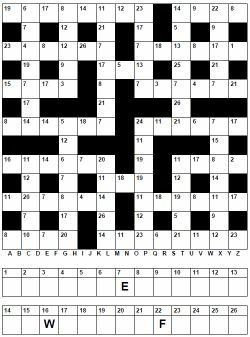 Each puzzle as well as an answer key has an A - Z cross-off bar, and it is a good idea to cross off letters you have used so you can visually see with ease which letters are yet to be placed. There are many different strategies that can be used to help you solve codeword puzzles, and of course a good grasp of English is essential to solve these puzzles. Remember that each letter from A - Z must appear at least once in the puzzle grid, and no number represents more than one letter, so once you have used a letter once it only appears in any other cell in the grid that contains that one number. The codewords magazine is on A4 paper, and you can download and print a sample Codeword Magazine page here. 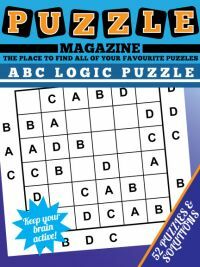 The magazine has 100 pages of puzzles which are all one per page so you can print each puzzle off as and when you wish to play it. 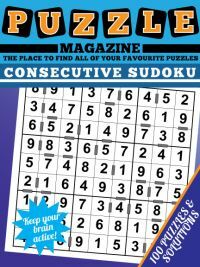 The solutions follow in 25 further pages at 4-puzzles-per-page, so in total there are 125 pages in this magazine. it uses UK English / British spelling throughout, so please note this fact if you are purchasing this magazine from other countries. If you are new to codeword / codebreaker puzzles, then one of the hardest parts can be getting started with the grid and making that initial break in. So what techniques are there available to you? Actually, there are quite a few. First of all, you will clearly use the given letters and place those in the grid. Sometimes these will quickly restrict the options for a word. But if not, where do you look? Various options are available to you as the cunning codeword solver! The first is to use frequency analysis, and look for which number occurs most frequently in the grid. As E, T, A are the most common letters in the English language, then it is most likely that these numbers represent these letters. You could lightly pencil in an option and then see if you can solve the puzzle from there. Other people like to look at the distribution of the numbers in the grid and use places where a number occurs twice in a row to quickly whittle down the options. There are some letters that occur as a double letter a lot more often in English than other letters - seeing these can be very helpful. For instance, you hardly ever get a double 'A' in English, so when you see a double number, and hence a double letter, you know it is almost certainly not 'A', and so on. A letter that regularly occurs at the end of words could be 'S' and denote plurals; and you might spot sets of the same three numbers each time which could be occurrences of 'ISE', 'ING' or other common endings. Really solving codewords is a true code-cracking puzzle, and over time you will get better at solving and develop an intuition as to which letters are more likely in certain places. If you get totally stuck, then you can also consider getting a helping hand from one of the many websites that enable you to put in letters and find words that fit. If you have A?T?R then how many words fit? Using the tools available online for free to look up words can help give you a feel for whether a guess you make is likely to be rewarded or not. Got any other codeword cracking tips? Let us know as we'd love to hear from you if so. 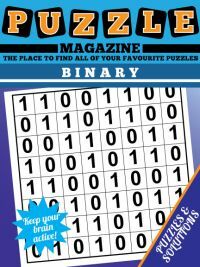 We hope you enjoy the codeword puzzles in these magazines.